In July 2010, the then US Secretary of State Hillary Rodham Clinton announced that “[t]he United States has a national interest in freedom of navigation, open access to Asia’s maritime commons, and respect for international law in the South China Sea [SCS].” To be sure, non-“dialectically,” her announcement has at least logic(s) problems. However, in Part 1 of the section “Other Findings” in this chapter, I have converted her announcement in terms of my dialectical one-dot theory, which is accompanied by (a series of) the crab and frog motion or the 1 2 3 4 5 A B C D E model, so as to enable readers to apply and to test them later on. By doing so, the contradictory and confusing announcement could be logically, systematically, and coherently presented. In Part 2 of the section “Other Findings”, I have attempted to first cite various definitions for the two concepts respectively, international regimes and (global) maritime commons, which are, ironically, a restricted space and are sometimes contradictory and confusing to many, if not most, students of international relations, especially those in East Asia. Second, I again converted them in terms of my theory and a series of crab and frog motion model, with future application by readers in mind. It goes without saying that the contradictory and confusing relationship between the two concepts can again be logically, systematically, and coherently presented. 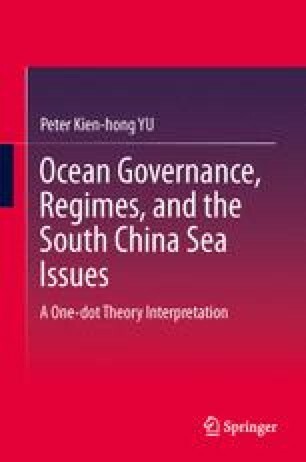 In Part 3 of the section “Other Findings”, the same theory and model are applied to study the Chinese U-shaped line in the SCS, the proposed multilateral Spratly Development Authority (SDA), and the suggested fair division of the SCS. The purposes are threefold: first, to present them in terms of my theory and a series of crab and frog motion model, which can help readers to apply and test them later on; second, to find out whether the dimensions of international regimes and the (global) maritime commons do exist within the line and the two proposals; and third, to find out whether they contradict with what Clinton said in July 2010.